RHYS BOWEN: To call Camille Minichino a woman of many talents would be understatement. First she holds a PhD in Physics. That's impressive enough for someone like me whose entire knowledge of physics was how to find the volume of a lead ball. But as a writer she wears many hats: she has published the Periodic Table Mysteries in her own name. 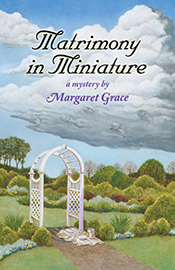 As Margaret Grace she writes the Miniature Mysteries. As Ada Adison she writes the Professor Sophie Knowles books AND as Jean Flowers she writes the Postmistress Mysteries. The new one, Cancelled by Murder, is out this month, as is her latest Miniature mystery: Matrimony in Miniature. I've always had a fascination for doll houses and I'm delighted to welcome Camille today for her thoughts on miniatures and life. CAMILLE MINICHINO: Making miniatures (models of life) and writing fiction (also models of life) have a lot in common. On my crafts table is a room box, about a foot on each side, newly painted and wallpapered, waiting to be furnished. On my computer is my latest novel, newly formatted and word-crafted, waiting to be furnished. Adding a descriptive passage to emphasize a point in a scene is like dropping that tiny string of pearls onto m'lady's dresser in the Victorian mansion dollhouse. Cutting a paragraph from a chapter in a novel translates into removing a too-large scatter rug that overpowers the rest of the kitchen furnishings in a modern dollhouse. 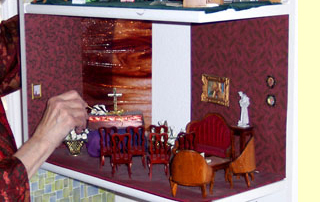 I change a verb for a more powerful statement; I change the draperies in the dollhouse dining room for the same reason. For a miniature scene or room box, after I choose the colors and assemble the pieces, I leave it on my crafts table for a while, living with it, looking at it from different angles over the course of a week or so, to be sure all the elements fit together nicely. Only when a particular design has stood the test of time, do I glue all the parts in place. I do the same for my novels, leaving each chapter or day's work to sit for a while. When I come back later, I see what does or does not fit. I notice phrases or sentences or plot elements that don't work well together, and make the changes. Only then do I consider it "finished" and metaphorically glue it in place. I have the most fun when I can combine my two favorite crafts, making miniature scenes and writing mystery novels. At writing conferences and meetings, I donate miniature scenes for charity auctions, often including miniature replicas of books that are featured on the panels. Here's one, put together for a recent conference, where the furniture is covered with pages of books and other publications. In each case—making a miniature scene or writing a novel—I'm creating a model of reality, a fictional world where things can be easier and often make more sense than in the life-size world. I enjoy combining my miniatures hobby with the themes of my mystery series, not only the Miniature Mysteries. • and, of course, one of the many dollhouses Gerry Porter of the Miniature Mysteries has built, this one a crime scene as well. Someone has wrecked the house! Another interesting aspect of making miniatures and writing fiction: Both endeavors involve cheating! 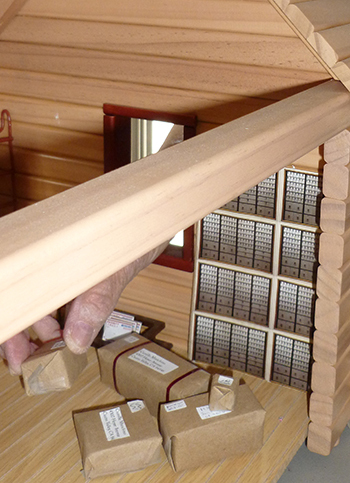 When I put a roof on a dollhouse, I don't have to worry about the materials really being weatherproof. Dollhouse admirers assume all will be well if it rains. When I move my characters about in a novel, I'm not concerned about filling their cars with gas or giving them a rest stop on a long journey, unless it's crucial to the plot. Readers assume the mundane things are being taken care of. In the world of dollhouses and most fiction, there's no laundry to do, and a houseful of carpeting can be changed in a matter of minutes. In my mystery novels, the good guys always win and justice is always served. RHYS: I love those little scenes you make for conventions, Camille. Does anyone else like making miniatures? I don't think I'd have the patience or precision. I tend to be like Lady Georgie and would drop glue on something. So please stop by to welcome Camille, Margaret, Ada or Jean... she will give away a signed copy to one of today's commenters. Camille, your exquisite miniatures are like tiny slices of life frozen in time. Now I must add your books to my teetering to-be-read pile . . . . There is something so comforting about reading your writing. It's like curling up on a winter night under an afghan in front of the fire. Addictive really. The miniatures are gorgeous. What detail, and such patience. WOW. Camille, thank you for your explanation of how you make your wonderfully, detailed miniatures. I have enjoyed reading some of your works written under your own name and as Margaret Grace. I will have to check out your other series. Multi-talented, indeed! 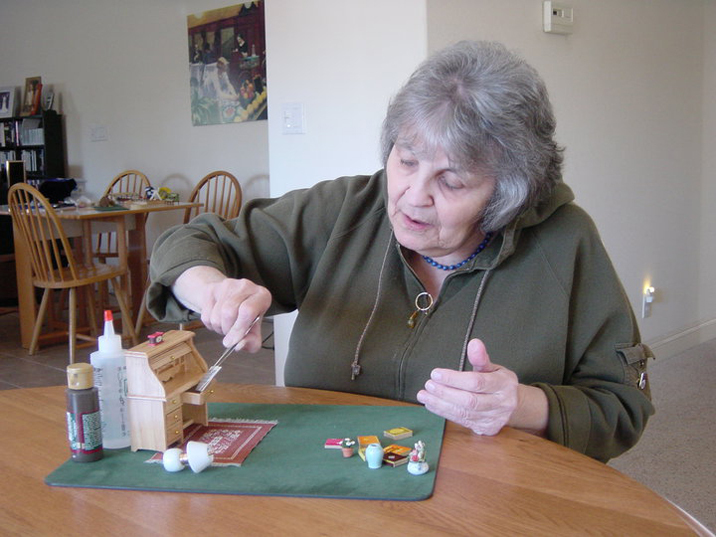 LOVE this analogy, Camille - writing and making a miniature. It especially appeals to me because when people ask me where my novels are set, the answer is always a house more than a place... a very specific house that I've mapped out and that lives in 3D in my head. I am bowled over by your miniatures. Something I couldn't do in a million years. I'm sloppy, short attention span, and all thumbs. My daughter, the architect, makes models an I am in awe. She got her habits and talents from her dad. Oh, Camille, how absolutely wonderful! I wonder… When you make the miniatures, and see the reality of your scene, has it ever changed the stories? And do you ever display them at events? Hooray for the new book. And oh, if we're chatting about whether we ourselves could do it? Ha. Always fun to see. Love the newsprint scene! Such a fascinating analogy! I'd go one step further, too: as a former kitchen/bath designer, I realized that many people do not have the ability to "see" complex interiors without such models. Not only do you have this, Camille, but I suspect it translates, as well, to the complexity of the structure of a mystery novel. Which is another skill most people don't possess. Not only can you "walk around in" a space in your mind, you can also move in a complicated plot, too. Now I need to sit with this idea for a bit and chew on it. You have opened up a whole new thought process here today! 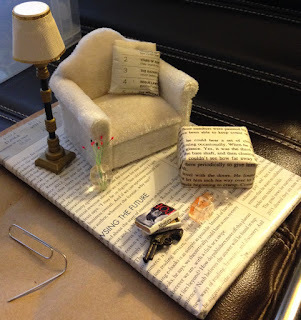 The miniature with the furniture covered in book pages is really cool! Taking miniatures to conference is a clever way to promote your books. Rhys, I'd be like you. I'd wreck the thing halfway through by dropping something or whatever. I love looking at miniatures and I wonder at the precision and patience required. But I don't think I have the coordination! But it's a great analogy for writing. Too much of something and you overwhelm the scene (visually or otherwise). Too little and it's empty. The colors have to be right. And yes, what a clever promo tool! I'm also a miniatures addict, and I remember some years ago you were kind enough to donate two of your books as a prize for our mystery-themed miniatures gathering. They were much appreciated. Thanks Jungle Red Writers and readers! You've given me so many new ideas today in your comments, I'm heading to my crafts table even before coffee. Rhys and others: spilling glue and paint on everything? It's all part of the process, like sticking myself while twisting a wire. So, another way that writing and crafting are alike for me: just as no one sees my very early ms. drafts, no one sees my first attempts at the minis that end up on the auction tables at conferences and events! What a fun post! I particularly enjoyed seeing the furniture covered with book pages. I'd have never thought to do that. You've encouraged me to dig out my miniature recreation of 221B Baker Street that I started thirty years ago and never finished. I hope you'll post that somewhere, Pattie! And while I'm here, I'll finally answer Hank's question about plotting and crafting -- yes, indeed. Marcia Muller, a more talented miniaturist and writer, has addressed this. For me, simply "walking" around a dollhouse or room box that's a model of my character's home, can inspire or unblock me. Thank you for sharing this passion of yours with us -- the miniatures are truly exquisite, and I especially love the one covered in print as well as the post office which was so accurate, down to the detail of the P. O. Boxes. Oh, and then the crime scene one was great. You know, I believe they are all wonderful, and it's awesome how they help you with your book settings. Camille, your miniatures are exquisite! (And I'm looking up all your books.) Can you tell us how you started making miniatures?? What a perfect analogy for describing writing, Camille. You've given me a whole new way to think about scenes when I'm reading. And, I am in awe of your beautiful miniature creations, such attention to detail, again just like writing. The reading chair scene is so wonderful. I'm sure that the patience required to create the miniatures spills over into your writing and into life. Patience is something I could use more of. Now, it would seem that I have lots of books to look up, with your different series and different names. Thanks for visiting the Reds today, Camille. I love doll houses. I always wanted one. The attention to detail, both in miniatures and novels, is wonderful. Deborah, just about the only "toy" I had as a child was a dollhouse my father made for me. In my dysfunctional "real" home, it was my refuge. I could pretend I lived there! Even better, my favorite older cousin, who was very creative, would sit with me for hours and help make furniture -- turning kitchen sponges into beds and sofas with scraps of fabric, or saving a tooth paste tube cover to use as a lamp shade, cutting flowers from greeting cards for wall decorations. 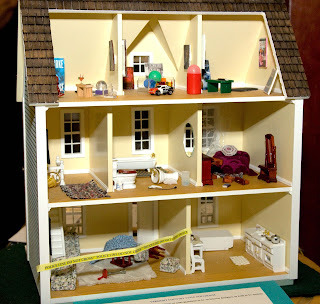 Although I no longer have that house, I never lost my love of dollhouses and miniatures. Every friend and relative has at one time or another received a mini from me, mimicking their lives. I've put together tiny dorm rooms, sewing rooms, a camping scene, even an old western jail once! TMI, probably, but once I get started . . .
Susan Shea, you're not old enough to know this, but when you're my age, you'll need less sleep! Oh, and one more note: if you think I'm a patient person, you haven't seen me when there's a long line at Safeway. Or anywhere! I love the same thing about both Rhys and Camille's writing--their wit. Both are wry observers of the human condition and don't hold back from commenting on same. It's no stretch at all to imagine the wit that goes into making miniatures. Nor is it hard to imagine Rhys dropping glue on them at just the wrong place. Wonderful interview! Thank you Camille for helping me get back a memory. My dad was a model railroader. He made the most wonderful layouts in our attic. I remember going to model train shows where men would show off there projects. Now that I think of it, this is doll house creation guy style. I don't have his skill with building, plus three cats and miniature creating does not really go hand in hand. I enjoyed working with miniatures years ago and still plan to eventually work my way back to tiny things. My favorite completed project is my Teddy Bear Condominium, which is now in need of some restoration on the outside. Likewise, I read Murder in Miniature a number of years ago. Thank you for reminding me about this series; I have some catching up to do! Camille, your miniatures fascinated me, the post office one goes with the Postmistress book that I am reading and enjoying right now. I've loved all your series, especially the Miniature books. The grandmother granddaughter relationship is the best thing about them, for me. Wish I had read your mystery novels when I had high school chemistry class. Maybe I would have gotten at least a B instead of failing Chem. Your books did not exist until after I graduated from college. I met you at a mystery book event at a small bookstore in the SF Bay Area, which is no longer there. I think it was around 1998? Adding more of your books to my TBR list. I read your Chemistry series and the Professor series.